I taught 3rd grade for several years before my first child was born. My husband says I am currently on hiatus, but I like to think of it more as retirement (tomato, tomahto). At any rate, because I have been an elementary school teacher, I feel as if I am in the perfect position to write a post about what teachers really want. Not only I can write from a teacher's perspective, but I can do so without the fear of an irate parent barging in the principal's office accusing me of complaining about her on the internet, even though the comment was very vague and she was definitely not mentioned by name. Ahem. Anyway, my oldest is in a Kindergarten program this year. He's been working on letters, sounds and sight words all year, but in the past couple of months, all of a sudden, he's been pointing out signs. And reading them. He's been picking up books. 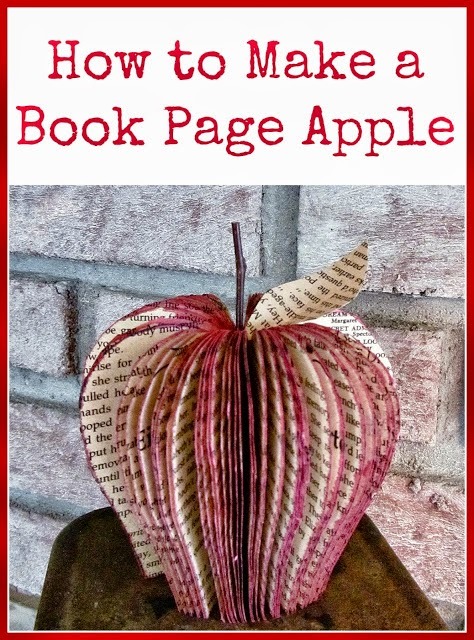 And reading the pages. I don't know why, but I was kind of shocked. When did this happen?? I can't even speak in secret spell-language to my husband anymore. I just dropped him off at school for a few hours a day and he emerged as this little literate person. Almost like magic. Except, it wasn't magic. It was his teachers. And when you think about it, the gift of literacy is one of the most important, special gifts you can give to another person. There are no amount of Target gift cards that can ever truly show the depth of appreciation for a gift like that. Still, it's nice to be appreciated, even if it's only a pack of Expo markers or a Mocha Frappuccino. 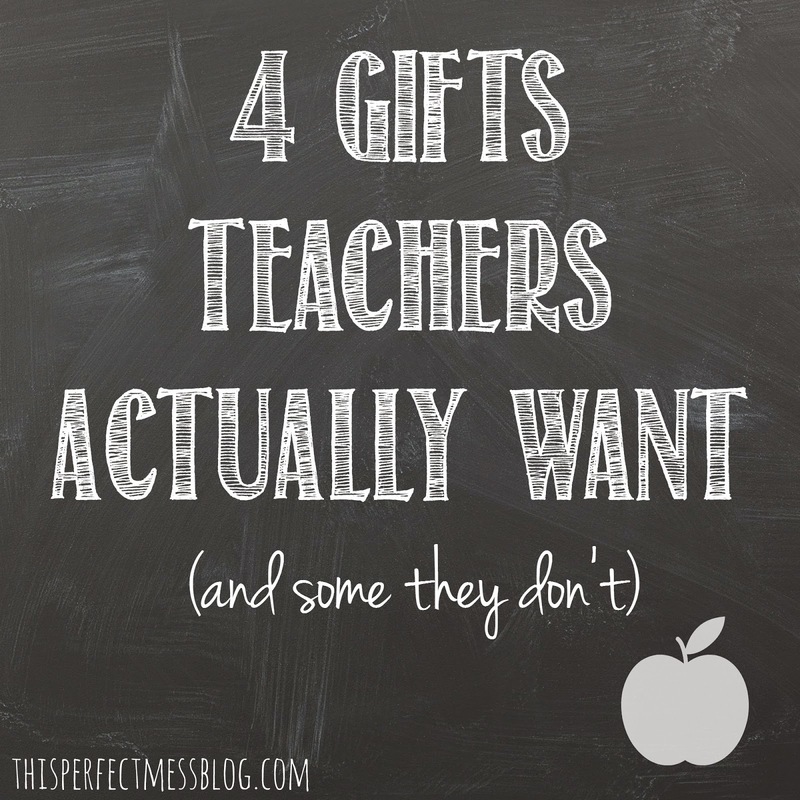 But first, I cannot in good conscience write a list of what gifts teachers want without specifically detailing the things they DO NOT want. Please, please no more mugs. 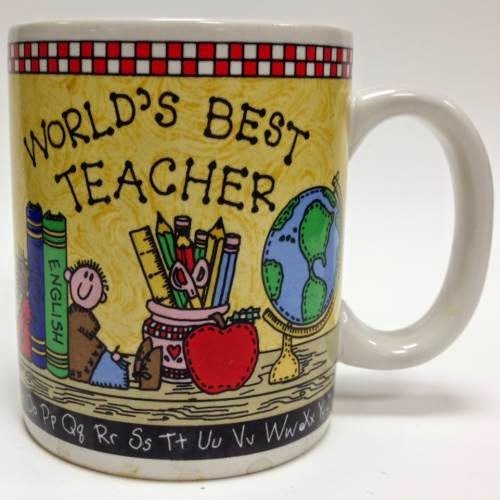 If your child's teacher has been teaching for more than one year, chances are that she already has a whole cabinet full of mugs that remind her that she is the World's Best Teacher every time she drinks her coffee. 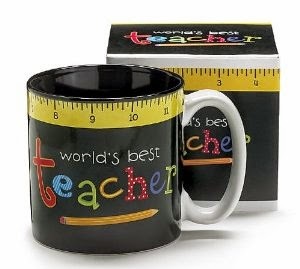 Do not get the teachers in your life "World's Best Teacher" mugs, plates, plaques or chunky knitted sweaters, unless that teacher happens to be a first year teacher. In that case, shower her with "World's Best" superlatives because chances are the novelty has not yet worn out and even though it is probably not the truth, he or she could definitely use the encouragement. This is so terrible I can't even think of a funny caption. One Christmas a student presented me with an extravagant basket of body wash, lotion, bath gel and the like. It was a beautiful collection, sure to last me at least 6 months. The only problem happened to be the scent. While I'm sure smelling like "Christmas Cookie" would be very festive in December, I didn't think it would have quite the same effect come June. Confession: I decided to exchange the basket for another flavor. After braving the mall crowds and lugging my basket through a long line, it was finally my turn. "I'd like to exchange this for a different scent, please." "Oh my, that won't be possible," remarked the clerk as she wrinkled her nose. "This scent is from our holiday collection...three years ago." And that is only one of many regift stories I could tell you. There was also the time I pulled a bracelet out of a bag that still had a card attached to it which clearly indicated it was originally for the student's mother. On another occasion a student handed me a package and announced, "Here, we forgot to get you a gift, so my mom got this out of the closet this morning." Your child's teacher taught him to add fractions. Your child will never forget the state capitals because his teacher sang them in a song to him 87 times. The teacher read The Adventures of Captain Underpants out loud so you don't have to. She does not get the luxury of hiding in a closet when she grows weary of hearing her name called every 2 seconds. She loves your child when you are not there. Give the woman a gift she really wants. I read somewhere that teachers spend about $500 of their own money every year on school supplies. If you doubt this fact, you have never tried to keep a third grade classroom stocked with number 2 pencils. It does not matter how many pencils you start with on the first day of school. By the second day of school they are ALL GONE. You might as well be teaching a class of woodchucks, as you will soon come to the conclusion that the only way it is physically possible to dispose of so many pencils in such a short time is that your students are actually wood-consuming rodents in disguise. You begin to feel that if you hear the excuse of "but I don't have a pencil" one more time, you may be forced to open the classroom window and throw yourself out. So please, buy the teacher in your life the largest box of No. 2 pencils you can find and, for the love of planning periods, go ahead and sharpen those suckers for her. Not only will you save her a trip to Staples, you may just save her life. 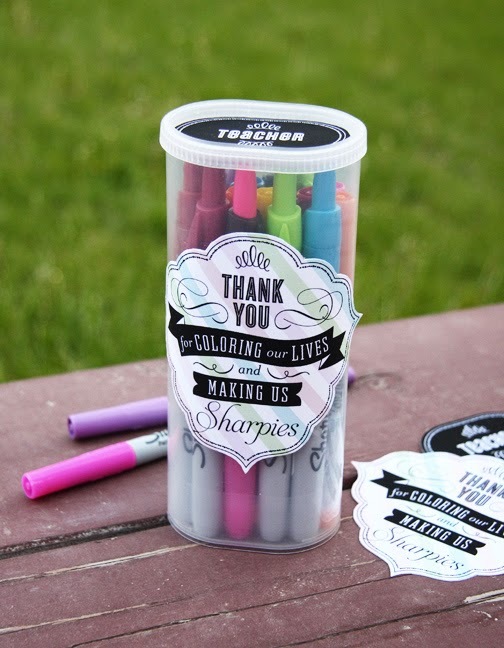 Similar to school supplies, teacher items are things for the classroom that the teacher uses (as opposed to the students) that she might not think of buying for herself. Here's a helpful rule of thumb. 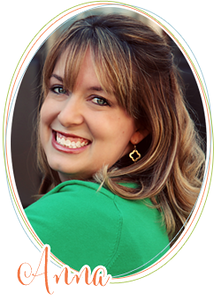 When considering a teacher gift, ask yourself these 2 questions: Will the teacher use it? Will the teacher use it before it has a chance to collect dust? If the answer is yes, then you are good to go. NO. I can see the dust collecting already. NO! WHY WOULD YOU WASTE PENCILS LIKE THAT? One time a mom bought me the most heavy duty pencil sharpener on the market after she helped me sharpen 200 number 2 pencils during testing week. I LOVED that pencil sharpener. The students were not allowed to touch (break) my very special heavy duty pencil sharpener. Another year the entire class went in together and bought me a fun, comfy chair for the front of the classroom. Class gifts, by the way, are the best way to go. 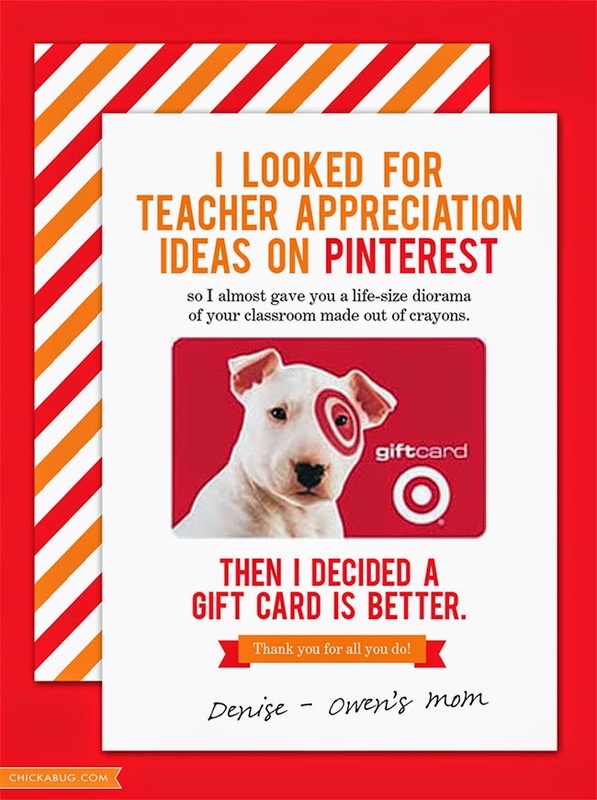 Any teacher would much rather receive a $100 gift rather than 20 $5 gifts. 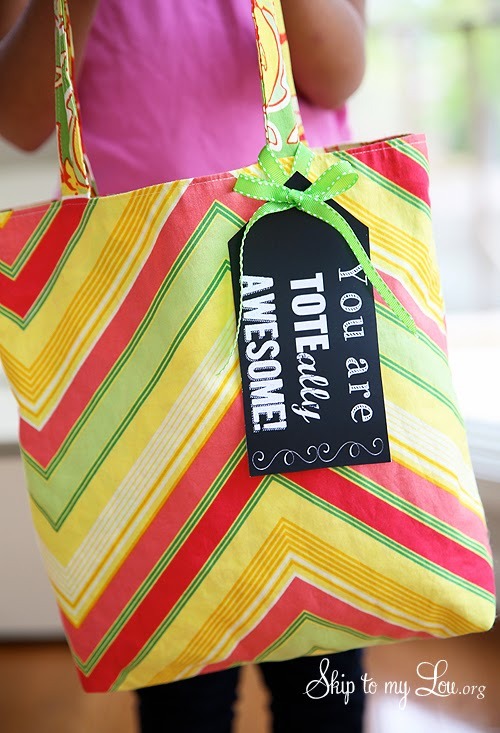 If a parent is organizing a class gift, GET IN ON IT. I know what you're thinking and you are wrong. Money is not an impersonal gift. Money is an AWESOME gift. When you take a teacher's salary and subtract the amount she spends on school supplies and also the amount she spends on trips to the dermatologist after an encounter with expired body lotion, that teacher makes approximately negative $2 an hour. If you were that teacher would you rather head home for the summer with 25 new mugs? OR would you rather head home with actual money to buy actual necessities like groceries or a pedicure? One year one of my fellow teachers received a gift to which the whole class contributed. She got a MONEY TREE. She was so excited that she carried that tree around with her all day long. 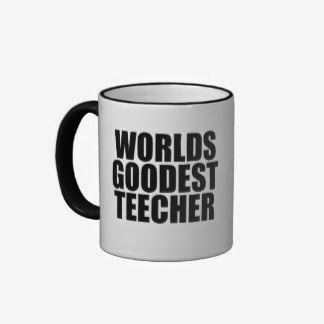 The rest of us glared at her jealously as we sipped from our World's Best Teacher mugs. 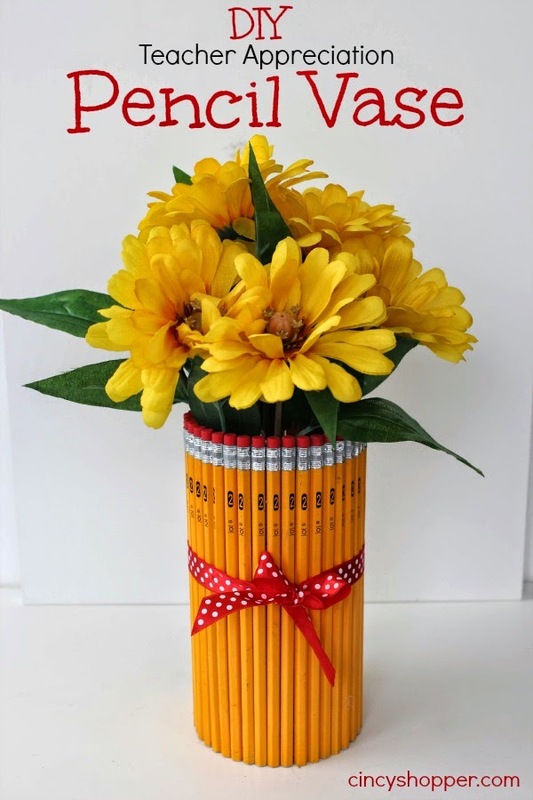 I know the thought of slipping the teacher a ten-spot feels awkward and kind of creepy, but there are plenty of ways to make a gift of money more personal. Pinterest has you covered. If it still feels icky, then go with a gift card. Gift cards are almost as good as money. 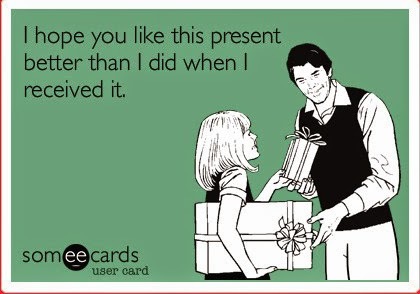 If you ask a teacher to name the one gift she would like most of all, she will probably say MONEY. 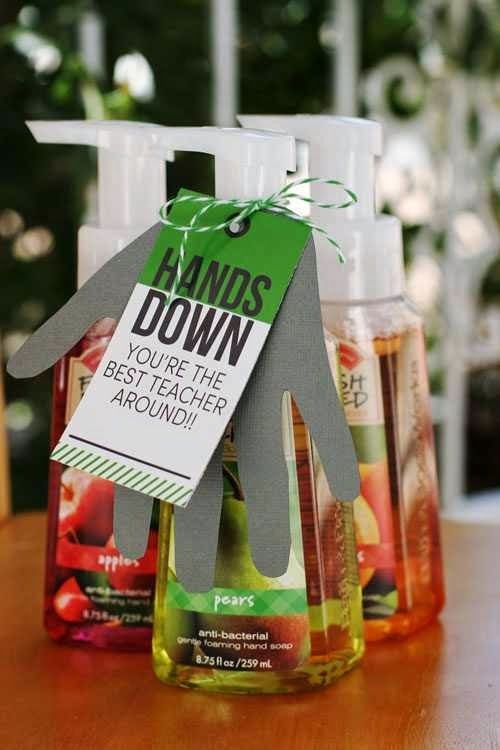 However, with the exception of the Bath and Body Works debacle, I don't really remember that many specific gifts from students. I don't remember what I bought with the gift cards or how I spent the cash. But I still have the notes. Occasionally I will come across the box of kind letters from parents and heartwarming notes and pictures from students, and the memories come flooding back. I open a card and remember that S was an amazing writer with a keen sense of humor beyond her years. I unfold a colorful drawing and remember that C was a beautiful illustrator with an artist's soul. I find a note and remember the journey with J, how she was so difficult at the beginning of the year that I would pray for her to be absent, but by the time she handed me this note on the last day of school there were tears in her eyes; she had become one of my favorite students and I could hardly stand to say goodbye. The notes are truly a treasure. Now that my own kids are beginning to have their own teachers, I am going to take my own advice. 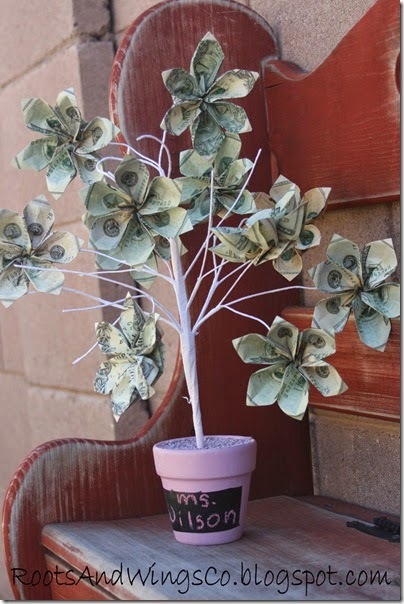 I may give school supplies or a gift card, or I may even initiate a class MONEY TREE! !, but no matter the gift, I will make sure to tell the teacher how much he or she has meant to us that year. And I hope to teach my children to do the same. As a teacher I don't expect gifts from my students, but it is really nice to get things I can use and don't have to spend my own money on.